July 21, 2011.- The electricity demand in Spain for the first half of 2011 dropped 0.6% with respect to the demand recorded in the first half of 2010 and grew 0.4% when correcting the calendar and temperature effects. One of the conclusions that can be drawn from this information is that we still have not reached the values of electricity demand registered before the economic crisis. On the other hand, the conventional gas demand in Spain in the first half of 2011 was 0.5% lower than the demand recorded in the first half of last year. 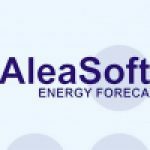 With this information in hand, Aleasoft are conservative with its estimates for electricity and gas demand. 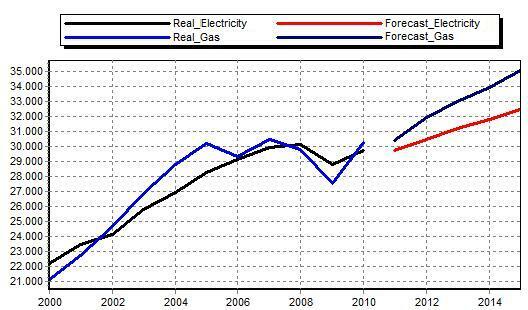 The electricity demand in Spain for the year 2011 is expected to be 0.01% lower than 2010. With regard to the second half of 2011, the electricity demand is expected to drop 0.61% with respect to the first half of last year. The conventional gas demand is expected to grow 0.5% in 2011 when contrasting with the values registered in the year 2010, and its demand in the second half of 2011 is expected to grow 1.45% with respect to the demand recorded for the second half of last year. Trend graph of the annual demand in Spain of electricity and conventional gas (hourly average): real and estimated values [MWh]. The combined demand of conventional gas and electricity in Spain for the first half of 2011 was 0.5% lower than the demand recorded in the first half of 2010. 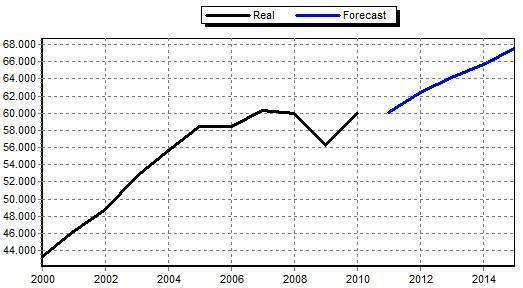 A growth of 0.25% is expected for 2011, thus reaching similar values to those reached in 2008. The combined demand of gas and electricity for the second half of 2011 is expected to grow 1% with respect to the second half of last year. Trend graph of the annual combined demand of conventional gas and electricity in Spain (hourly average): real and estimated values [MWh].